Home » Bollywood News » Priyanka Chopra's sister Parineeti Chopra got brutally trolled for a very shocking reason during Namaste England promotions! Priyanka Chopra's sister Parineeti Chopra got brutally trolled for a very shocking reason during Namaste England promotions! The people who loved the chemistry between Arjun Kapoor and Priyanka Chopra's sister, Parineeti Chopra in Ishqzaade will soon see them again in their upcoming flick Namaste England, the promotions of which are going on in full swing. The actress, who shocked everyone with her amazing transformation sometime back by losing oodles of weight was the one who caught everyone's attention during a promotional event that happened in Mumbai where she came from Lucknow where she is shooting for Jabariya Jodi opposite Sidharth Malhotra. ALSO READ: Bigg Boss 12: Pornstar Danny D, Mahika Sharma and this ex-Splitsvilla contestant will get this whooping amount for Salman Khan's show! The dress that the actress wore caught everyone's attention and it was clear that she was purely uncomfortable in the dress she was wearing. Not only this, her hair were also making her uncomfortable. This is the reason why the actress like the others got brutally trolled on the social media account. The people on the social media could not stop themselves from commenting on the type of cloth she wore. Series of comments started pouring in after her picture from the promotional event went viral on the social media. 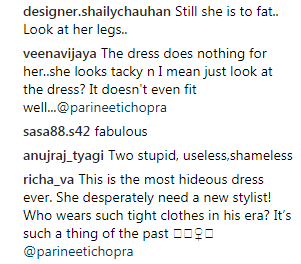 From commenting on the length of her dress, to her weight to what not people did not spare her. Talking about the film, it will be released on December 7, 2018. For more scoops like these, stay connected with us! ALSO READ: Splitsvilla 11: Sunny Leone reveals a naughty thing that a contestant did with her during the show and you will be shocked!